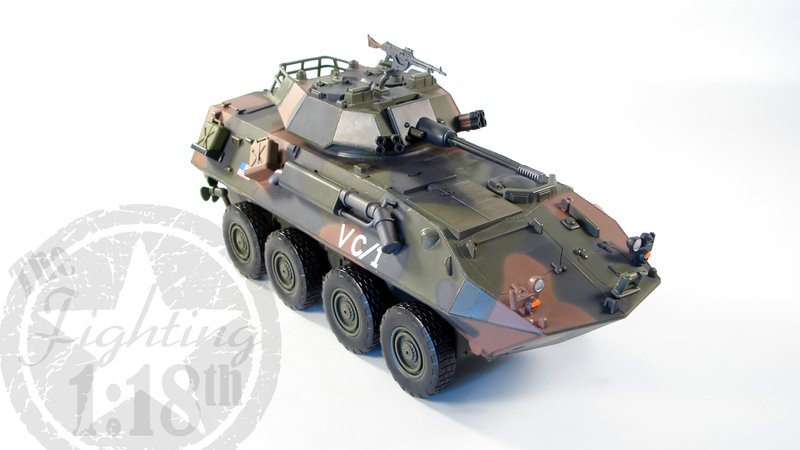 General Dynamics Light Armored Vehicle LAV-25 | The Fighting 1:18th! 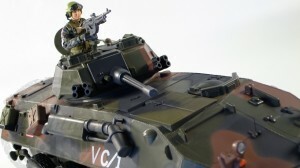 In 2008 modern era 1:18 scale fans were sent into a flurry after it was confirmed that Unimax was going to release a 1:18 scale IAV Stryker under its Forces of Valor: Bravo Team brand. 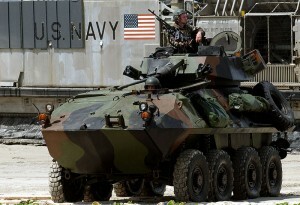 Collector’s began speculating when the Stryker would be released. When Unimax finally commented on the situation they reported that they were having issues in China and the vehicle would be delayed until the first quarter of 2009. In the fan community unsubstantiated rumors began surfacing about licensing issues with General Dynamics and even China’s refusal to continue building toy versions of American weapons of war. Earlier this year Unimax did finally release a 1:32 scale version of the vehicle, fueling fan’s hopes that the 1:18 scale version would eventually become a reality. However, a few months ago, the unexpected happened. On the Unimax website the 1:18 scale promotional image disappeared from their site and was replaced with a 1:18 scale General Dynamics LAV-25. Unimax’s first original 1:18 scale vehicle was now replaced with yet another rehash of a vehicle done by another company, in this case BBi. Disappointment aside, some held out hope that Unimax would do something to improve or, at least, differentiate itself from the BBI release. Unimax’s Tiger Tank was given a Zimmerit Coating and the M16 Quad .50 Halftrack’s bed area was more accurate, and the turret was actually able to traverse unhindered. A member of The Fighting 1:18th! Sewing Circle, art2614, surprisingly discovered the Unimax LAV-25 at Toy’s R’ Us under a new Unimax branding called “Assault Force.” Unimax’s 1:18 scale offerings were originally a Target Exclusive under the Forces of Valor “Bravo Team” branding. With art2614’s timely reporting, I went out to my local Toy’s ‘R Us and managed to pick one up. I have the LAV in hand and I can now officially tell you about my disappointment. This version of the LAV was a complete and utter failure. The piece provides no upgrade or change from the original BBI version and has even compromised Unimax’s own formula for success. Powered by a 6V53T Detroit Diesel turbo-charged engine, they are 4-wheel drive (rear wheels) transferable to 8-wheel drive. These vehicles are also amphibious, meaning they have the ability to “swim”, but are limited to non-surf bodies of water (no oceans). While engaged in amphibious operations, the maximum speed is approximately 12 km/h. The current SLEP (Service Life Extension Program) modifications will hinder/eliminate amphibious ops. The vehicle has been through many changes through the late 90s. The new modification or SLEP has changed the LAV-25 to the LAV-25A1 standard and has been completely fielded. Funding has been approved for continued upgrades to the LAV family to bring them up to the LAV-25A2 standard. 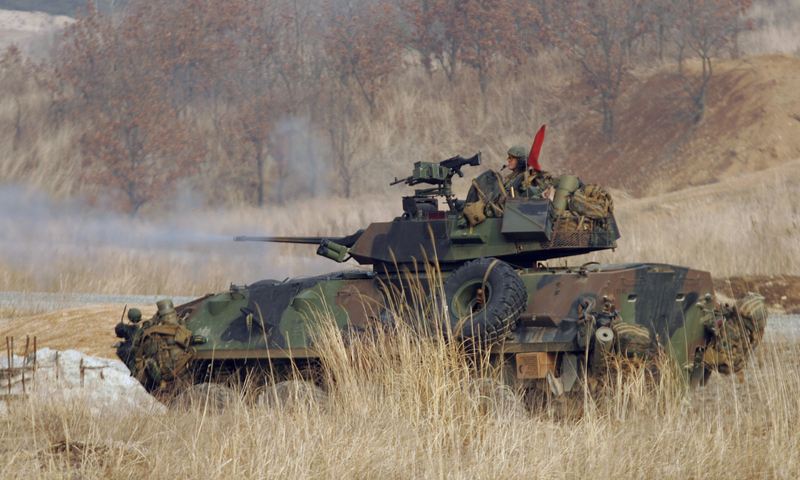 Phase I improvements include increased external and internal ballistic armor upgrades, improved fire suppression equipment, and upgrading the vehicle’s suspension to the Generation II standard. Phase II upgrades include replacing the turret hydraulics with an electric drive system and replacing the thermal sight with an improved model incorporating a laser range finder. 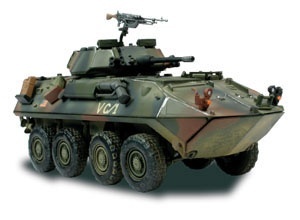 The LAV-25 is a wheeled amphibious armored personnel carrier based on the Swiss Mowag Piranha series of wheeled armored fighting vehicles. 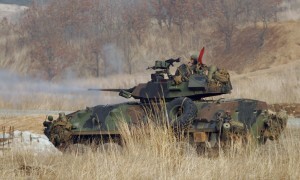 The most well known user of the LAV-25 in the United States is the Marine Corp Light Armored Reconnaissance Battalions. The Unimax version has a C/1 marking on the vehicle, which has been a pain trying to identify, but I can only assume this particular vehicle being represented is part of Charlie Company, First Armored Reconnaissance Battalion. But again, that is simply a guess. Any help with this is appreciated. 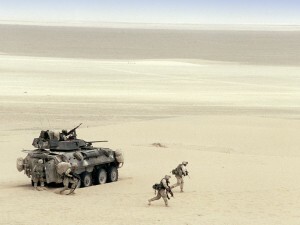 The primary mission of the Marine LAR battalions is recon in force. These units go ahead of the main fighting units and swiftly penetrate enemy lines to provide vital intelligence such as location, size, and strength of the enemy forces. Previous: New Marauder IDS “Interlocking Display System” Stands now available! 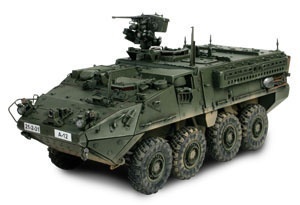 Funny how UNIMAX makes the Stryker in smaller scale but not in 1:18th. If they did; it would surely sell. Quite immensely I might add. Does the back of the vehicle have names on it? If it does, then you are correct it is C Co 1st LAR, I also saw this at Toy’r’us. The vehicle was commanded by my platoon sgt, Ssgt Kirby. I noticed that all the names on the back were spelled wrong, I am sure on purpose.